Industrial labeling is an essential activity in any facility, and for many different reasons. For example, it can help to improve safety as well as organization and even efficiency. In fact, proper labeling can benefit almost every measurable area of the facility. If you don’t already have a proactive labeling policy within your facility, look at the following ten points to see why it is so important. 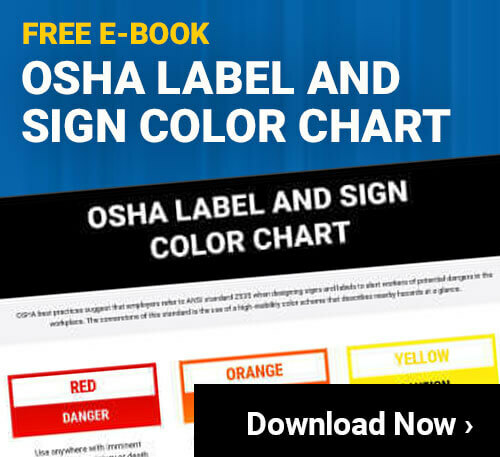 One of the most important reasons why you need to focus on proper industrial labeling is that it is often required by organizations like OSHA. If you are using certain hazardous chemicals, for example, you will need to have the containers labeled using the proper industry standards. In addition, you must put these types of labels on any products that contain these chemicals before you ship them out. There may be other regulations where you need to have proper labeling too. Machines and pipes that use or transport hazardous items will often need to be properly labeled. Even if it is just steam that is being transported, you should likely have it clearly noted so nobody accidently burns themselves while working in the area. Many facilities will use industrial labeling to distinguish different machines or vehicles within the facility. This is much easier to use than checking the VIN or serial number each time, and it can make scheduling the maintenance of these items much easier. If you have an industrial label maker, you can print off a label that has a bar code or other easily identify mark. This can then be scanned by the maintenance team every time they change the oil or perform any other type of work. This can help them to log all the activities they have done, and even make it so all their activities are tracked through computer programs. However you decide to actually track and store the information, you will find that having each machine tagged with a high quality label is very important. If you decide to do this, however, you need to make sure you are using durable labels that will last a long time. Most traditional labels will end up fading or getting scratched off. Using vinyl labels, however, can allow them to last for years. Most people don’t really think about where safety equipment is unless they are going through a drill or in an actual emergency. Unfortunately, this can mean that people won’t be able to react as quickly as they should when something serious is happening. Using labels to show people where different types of safety equipment are located can be a great way to help people get where they need to go in an emergency. You can have labels that are used as signs to point people in the right direction, or simply label the area above the equipment so that it can be seen from other parts of the facility. There are many different options, and while this alone isn’t enough to ensure people know where to go for things like fire extinguishers, AED machines, emergency eye washing stations and other items, it can be a help. Even something simple like this can help cut the emergency response times down by seconds, which can be lifesaving in some situations. Many facilities use industrial labeling for organizing their warehouse or other storage areas. Sometimes this is an obvious improvement, such as when you use the labels to mark where on a shelf each item goes. Other times you can get more creative in how you use these labels. For example, you can use labels on the sides of each aisle in a warehouse to mark what types of items go where. You can also print off pictures of specific items so they are easier to find at just a glance. This is especially important when the items are stored in boxes so they are harder to see. You can also use these labels in other parts of the facility to help improve organization. If you have a lot of tools, you can use labels to identify where they go. This can be used in conjunction with a foam tool organizer, for example, to make it as quick and easy as possible to organize all these items. Many facilities have items that are fairly small, but extremely valuable in use at the facility. These items are sometimes at risk of being stolen, and putting a label on them will be a good deterrent. High quality industrial labels will be very difficult to remove, and it will make it clear that it is owned by the facility, even if someone brings it home. This could be useful on certain tools, or even laptops or other computer equipment. Whatever the case, having the company name marked on these items will help ensure there is no dispute as to who owns the item or where it belongs. Similar to marking ownership, except the benefit is that you can improve the way employees think about the company. By having your corporate logo on different items, people will see it on a regular basis. Over time this can help get people to have a better opinion of the facility. Of course, this alone isn’t going to ensure you have the best employee engagement, but it is a small thing that can provide a nice benefit. In addition, since these labels are so inexpensive, especially when you make them yourself using an industrial label printer, it is a great investment to make. Most facilities have dozens of pipes that run all through the facility. It can be extremely difficult to track them from the source to the destination, which is often necessary when looking to perform maintenance or other work on the pipes. Having industrial labels placed on the pipes every 20’ or so will really help make it easier to identify what pipe is what. This type of labeling can be something as simple as a solid color that represents a specific type of pipe, or you can print off a label that has words on it. Whatever you decide to do, having these labels on the pipes throughout the facility will make it easier to work on them, and safer as well. Another great use for these labels is in making temporary signs. While most facilities will have commonly used signs like ‘slippery when wet’ already available, there are others that may only be needed once. An example of this could be if you were holding a special meeting in an area and you wanted to place a sign in the hallway. You can print off a custom label and stick it to a post or other item in the area. This will look great and is much more durable than a simple paper sign (which is often very important in facilities). In addition, this allows you to make signs that can be used outside in the rain, since industrial labeling won’t get damaged in the rain. High quality labels can also stand up to extreme cold and heat when necessary, so no matter where you need a sign, this is a great option. Many companies have a variety of locations where they do business. This could be different buildings on one large campus or different facilities that are several states away. Whatever the case, you will often have to send things between the different facilities. Using high quality labels to put on the items that have to be shipped around can make it easier to read and track. This will help to prevent items from getting lost or delayed during the transport. This is especially important for those companies that don’t use third party shippers like UPS or FedEx. The labels allow the shipping to be easier, which is critical for this type of work. Another great thing that industrial labeling can help with is new employee training. Having labels placed throughout the facility with information on them will allow new employees to read it and get a quick understanding of what is going on. This way they can get a more holistic experience of the facility, rather than just learning about the one area that they work in on a regular basis. It can be very beneficial to know more about the company as a whole as that can help people to be more motivated and understand their role in the bigger picture. In addition, placing labels along emergency exits or other common routes can help newer employees to get a feel for the facility much more quickly. While these ten benefits make it obvious that all facilities should be using industrial labeling, you should also think about other uses too. There are undoubtedly dozens of different places within your facility that could benefit from this type of labeling. Just start thinking about it now, and keep it in mind whenever walking through the facility. Before you know it, you’ll have made many excellent improvements by using these labels. Industrial Label Printers infographic by cssgeoff.